Bishop Davies will say that fidelity to the teachings of the Successor of St Peter will be fundamental to the renewal of authentic Catholic life in the Diocese of Shrewsbury. “I am certain there can be no progress for the Church in the Shrewsbury Diocese without this living, faithful, loving unity with the See of St. Peter, with our Holy Father, Pope Francis,” the Bishop will say in his letter. Bishop Davies will also ask every parish and religious community in the diocese to offer a Mass for Pope Francis on Wednesday March 20 following his installation in Rome on Tuesday March 19. He will also invite each of the faithful to offer a small act of self-denial for the success of the mission of the Pope. Bishop Davies will say: “Our Catholic faith leads us to recognise and promise today, as I promised on the day I became a bishop, to be faithful, obedient and united under the authority of the Successor of the Apostle Peter (Rite for the Ordination of Bishops). In the Catholic heart, there is not only a recognition of the vital ministry of the Pope, but a love for the Pope. He continues: “Amid testing times, the Pope must always be ready to face a form of martyrdom. The Pope is neither a politician nor a celebrity, but always a witness to the Truth, to the One who was crucified, to the Faith handed down by the Apostles. The word ‘martyr’ means ‘witness’ and describes those who suffer and die for Christ. In these hopeful and challenging days, when the Church sees a great expansion of her life on a global scale with more Catholics and more vocations than at any moment in her history, together with the sad phenomenon of the de-Christianisation of societies like our own, much is asked of the Pope. The full text of the pastoral letter of Bishop Davies follows. Please contact Simon Caldwell, diocesan communications officer at simon.caldwell@dioceseofshrewsbury.org. 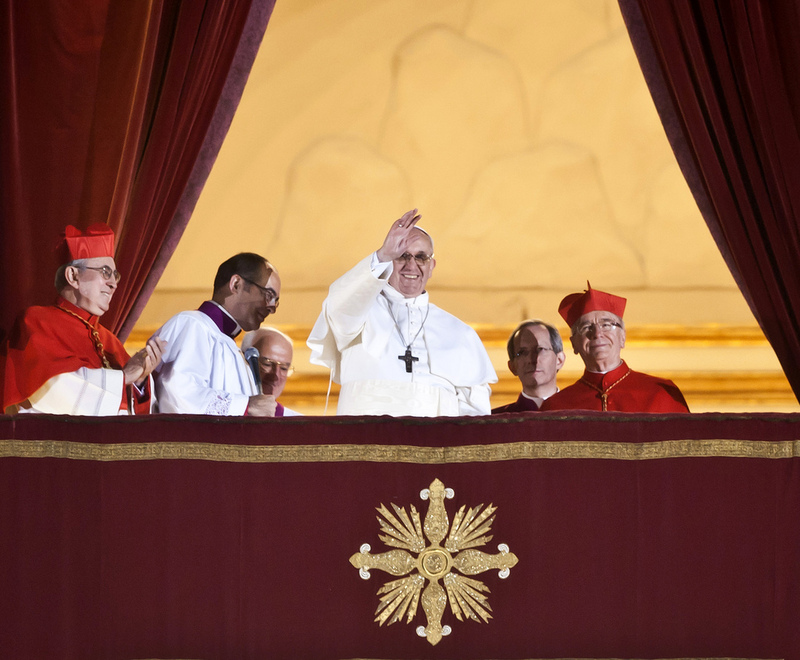 Pope Francis was elected Supreme Pontiff on 13th March 2013, on the second day of the Conclave to choose the 265th Successor of St Peter the Apostle. An Argentine and a Jesuit, he is the first pope to hail from the Americas and the first member of the Society of Jesus to serve as Bishop of Rome. He is the first non-European pope since St Gregory III, a Syrian, was elected in 731. He has taken the name Francis after St Francis of Assisi, the 13th century Italian founder of the Franciscan order and a man who lived a life of radical evangelical poverty and holiness and who received the divine injunction from Our Lord to “rebuild my Church”. Pope Francis succeeds Pope Emeritus Benedict XVI, who relinquished his ministry on health grounds on February 28. The former Cardinal Jorge Mario Bergoglio, Archbishop of Buenos Aires, was born on 17 December 1936 in the Argentine capital, though his parents are of Italian extraction. He studied as and holds a degree as a chemical technician, but then chose the priesthood and entered the seminary of Villa Devoto. On 11 March 1958 he moved to the novitiate of the Society of Jesus where he finished studies in the humanities in Chile. In 1963, on returning to Buenos Aires, he obtained a degree in philosophy at the St Joseph major seminary of San Miguel. From 1967 to 1970 he studied theology at the St Joseph major seminary of San Miguel where he obtained a degree. On 13 December 1969 he was ordained a priest. From 1970 to 1971 he completed the third probation at Alcala de Henares, Spain, and on 22 April 1973, pronounced his perpetual vows. On 20 May 1992, John Paul II appointed him titular Bishop of Auca and Auxiliary of Buenos Aires, He received episcopal consecration in the Cathedral of Buenos Aires from Cardinal Antonio Quarracino, Apostolic Nuncio Ubaldo Calabresi, and Bishop Emilio Ognenovich. of Mercedes-Lujan on 27 June of that year. He was a member of the Congregations for Divine Worship and Discipline of the Sacraments; for the Clergy; and for Institutes of Consecrated Life and Societies of Apostolic Life; the Pontifical Council for the Family; and the Pontifical Commission for Latin America.